Whether it's a new toy, a day at the arcade or the newest i”Gadget”, children will learn quickly that saving money is necessary to get things they want or want to do. My 3 and a 1/2 year old daughter has the same coin bank that her father did as a child. It's a rain boot that saves “Saving for a rainy day” on the side and is super cute! We told her how her daddy used to put coins he earned for being good in the boot and would then take his boot to the store to get a new toy or book. That's all it took. Her boot keeps getting fuller and fuller and anyone that comes to our house must see the boot! 2. Make saving money a big deal. Now I know not everyone will have the same coin bank they had from a child to give their children but the idea is to make saving money special and important. Take them to the store to pick out their first coin bank. Ask them what they want to save for. Tell them how they will earn money. My daughter earns money for helping to pick up her toys, putting her dinner plate in the sink, etc. Kids have a short attention span, especially when they don't understand what you're saying. There are lots of great games and activities you can use with your children to teach them the value of saving money. One of my favorite tools is Dave Ramsey's Financial Peace Junior Kit . A goal chart with stickers or a picture of the item they are saving for on the coin bank are great visual cues that young children can relate to. My daughter also loves putting the coins in the bank herself! 4. Hard work pays off! As children get older, it's a good idea to reinforce the idea of how earning money works. Just as they earned a quarter for picking up their toys when they were 4, teach them that mowing lawns in the summer when they are 15 will earn them money for a new iPad. Praise their independence and dedication towards a goal. 5. Giving is as importing as saving. This is a valuable lesson to teach your children as they get older. Not only is saving money for yourself important but giving what you can to others in need is equally as important. Sit down with them to pick a charity to donate to or a cause to support. If they love pets, consider donating to your local shelter. If they want to help other kids, possibly your local children's hospital or Ronald McDonald house. Let them know they are making a big difference by giving to others. 6. Save money by saving money. They've earned the money now help them hold onto as much as they can. Teach your children to look for sales or coupons or to buy used. If it is a big ticket item, research the product with them. Show them that by saving money on this item, they have more to put towards the next goal. 7. Teach them cash, NOT credit! As your teenager or young adult heads out on their own, they are sure to be enticed by multiple credit card offers designed to lure in young applicants. Sit down with your children and explain to them how credit cards work. Make sure they understand that a credit card is not money they have earned but money they must borrow — and then some. Reinforce that saving until they have enough money for an item shows self control and that they are ultimately saving money in the end by being debt free. 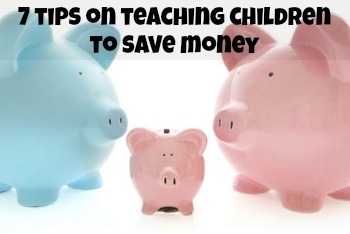 Be sure to check out other great ways on how to save money with kids here!